Neon underglow and LED underglow are two main types you can purchase. Neon has been the go-to underglow type for a long time, but over the past few years it’s slowly but steadily being replaced with LED lights. In this article we’ll do a basic overview and comparison of neon and LED underglow systems. We’ll take a look the basic facts about both neon and LED, and see pros and cons of each system and their main benefits or negative sides to help you make the purchase decision easier. Neon tubes use Neon gas and other different gasses inside the glass tube which produce light when electrical current passes through them. For example a neon tube filled with Helium will produce a yellow color, Neon (gas) red, Argon produces red or blue, Xenon blue to green, and Krypton yellow to green. Other colors can also be achieved by using colored glass. LED stands for Light Emitting Diodes, where the source of the light emission is from dozens or more small light diodes that form a lighted surface. LEDs are very commonplace today, and are being used in mobile phones, traffic signs, billboards, cameras, remote controllers; really, anything you can think of. Even cars are nowadays often replacing break lights and other lamps with LEDs. Neon versus LED – Which one is better? 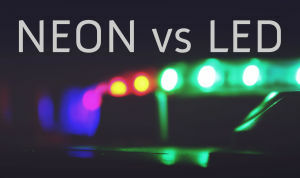 You can see a comparison of both LED and neon lighting systems’ main features below! Compared to neon tubes, LED lights use as much as 70% less power. Power consumption isn’t necessarily a problem in vehicles since both systems run on the same power 12V power source, but those of you who want to keep your car battery live longer or are environmentally conscious LED diodes are definitely the prime choice. Neons also emit more heat unlike LEDs, but for underbody glow systems this fact is less relevant. LED lights are capable of emitting more illumination than neon, but for underglow this feature is less important. Both systems are perfectly capable of illuminating the road beneath your car. Neon lights are typically more soft, warm and vibrant, while LEDs tend to be more bright and have more strong and saturated colors. However, this apparent disadvantage can easily be overshadowed by the fact LEDs can be dimmed if necessary, and are capable of emitting millions of different colors and hues. Neon underglow is only capable of emitting one color. It’s great if you know exactly which color you wish to use, but if you want to experiment or change things up after awhile it won’t be possible without changing the entire system. Neons give out an even glow in a wide area, but with the technological improvements to LED lights over the past few years this advantage is no longer relevant either. LED underglows can also cover a wide angle with zero deadspots. LEDs can also flash or fade, but be warned: flashing lights are illegal in vast majority of states. Review our state underglow laws before using! LED lights are some of the most durable, long-lasting lights on the market today. LEDs can last for over 50,000 hours (5+ years of continuously being lit), and although they may not last this long they are still far more durable than their counterpart. Neon on the other hand has a lifespan of 8-10 years, but it also has other components (transformer) which is estimated to last for about 5 years. Five years is still more than reasonable for undercarriage lighting system for a vehicle. LED diodes are completely shock proof and unlikely to get damaged unless under extreme circumstances (car accidents etc.). Neon tubes on the other hand are more prone to damage. The tubes are actually made of glass, so they can rather easily get damaged. Small rock propelled directly into the tube is sure to break it, and this can happen even when driving on asphalt. If your vehicle is mostly used in rough terrain (driving through tough grass, unpaved roads, or similar), neon tubes can get damaged far more easily than LED diodes. Once neon tubes crack, they are useless and will have to be replaced. LED lighting can withstand way more punishment and even in cases where some diodes get damaged, others may still work. When it comes to durability, the advantage is by far in LED’s favor. Neons definitely take more time and care to install. Since the tubes are easily damaged you need to be careful not only during the installation process, but also ensure they are properly attached and connected. Any variance where the tubes are not perfectly steady may cause them to break while driving over potholes or rough terrain. In fact installing neons is always better left to the professionals, so we don’t recommend any DIY jobs at home. LEDs on the other hand are plug and play. Mount the lights, connect the wires, and power it up! You can easily do it yourself and save some money in the process, and it doesn’t have to be perfect to do its job. Often the most important factor to consider these days, price can easily determine which system to buy. Neons are more expensive than their LED rivals due to the production costs, so the latter have more acceptable prices. LED lights are more durable, emit more colors, easier to install, use less power, and cheaper. Neons have no functional or other advantage, in fact they even have some disadvantages which make them inconvenient in certain cases. Since there is no realistic advantage to using neon, we definitely recommend buying LED underglow!